2. To quote @robinjabraham off twitter: “Manmohan Singh has never been a politician…he’s always been a doer and that’s all I care about”. This resonates totally. I’m so glad that the people of India have recognized the difference between politics and governance, and have voted in the latter. 3. This is proved by the fact that many state governments that have performed really well, despite their politics, have been rewarded, like AP, TN, Orissa, Rajasthan, even Maharashtra and Gujarat. 4. Of course, I cannot be happier about the fact that we will not have the BJP and it’s allies ruling us – they operate out of a culture of fear, negativity and cynicism that was evident in their personal attacks on the PM. 5. All that noise about regional parties ‘taking over’ the national elections has proven to be just that – noise. The two national parties have the votes for the most part. Having said that, it will be interesting to see how each state votes in State Assembly elections! Moreover, am glad as a citizen that there will be no horsetrading now!!! 6. I think we’re seeing the emergence of a very smart, astute, patient and gutsy Rahul Gandhi in this election. I wonder whether it’s going to make BJP go back to a more hard-line Hindutva stance with Narendra Modi as the key anchor to take on Rahul! 7. I’d love to see the split up of votes for the online population – would be good to study the effectiveness of the online campaigns from different parties. The BJP had a lot of presence – however I do believe they were ‘pushing’ their case through advertising, rather than holding conversations that really mattered. Participatory democracy and transparency in governance and policies are still a long way off. acc.to Prannoy Roy on NDTV – no other country counts its votes as fast as India. Is this true? 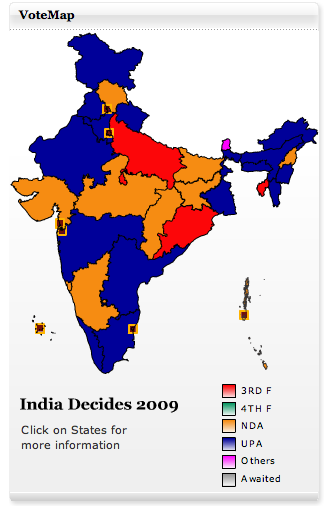 #indiavotes09. leads rolling in quickly! The next 5 years are the most potent tools for Congress to rework the pre 90’s/ Rahul Gandhi sure will be groomed to be the next Pm contender, INC needs to rope in more youth in the cadre, give a serious thought about corruption and security, with Manmohan leading from the front Economy should see reforms and resurgence however Rahul, Sonia and other leaders have to focus on bridging the increasing economic gap, The scenario looks so healthy for a revolutionary approach to governance. I am excited and happy people have made the right choice.